"The mission of Fidget Guiders is to bring fun into footwear." The sneakers are called Fidget Guiders because of the cool compass design which can be educational in regards to teaching children different directions. I used the word fidget because you are able to attach your fidget spinners. What is the mission of Fidget Guiders? The mission of Fidget Guiders is to bring fun into footwear. 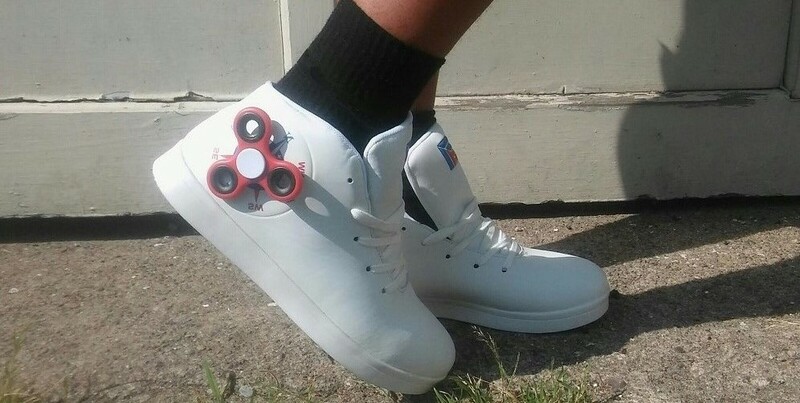 The key feature is being able to attach your fidget spinners to your shoes. You can customize them however you want. What makes a good shoe is the level of comfortability, durability, and being able to customize it the way you want. What are some of the greatest challenges in the shoe industry today? The greatest challenge in the shoe industry today is competitiveness. Everyone is looking for good quality shoes for a good price and big companies all around the world are competing to deliver. What makes Fidget Guiders stand out in the midst of all the competitiveness is the fact that we are providing more than just a pair of shoes. We are also bringing people together. Fidget Guiders will allow people interact with each other more with the trading of fidget spinners. Also, people can use LED spinners to cross the street at night to appear more visible which will make night walking more safe. What is the greatest achievement of Fidget Guiders? The greatest achievement of Fidget Guiders is the fact that I was able to make the idea of the shoe a reality and then create a functional prototype out of an old pair of shoes. What is the plan of Fidget Guiders in 2017? The plan of Fidget Guiders in 2017 is to spread it throughout the world. I believe it will be one of the biggest trends of all time and will evolve into an even better product over the years. My advice for future entrepreneurs would be to follow what you truly believe in no matter what obstacles may be in your path. Hard work really does pay off in the end. World's First Fidget Spinner Shoes.